Wireless Festival and Hard Rock Calling, previously held in London's Hyde Park, have been scheduled for July ahead of the full opening of the Olympic Park in Stratford, east London, in spring next year. Music promoter Live Nation has won exclusive rights to host major music concerts in the North Park and stadium. 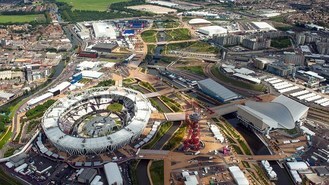 It is the inaugural contract for Queen Elizabeth Olympic Park. John Reid, president of concerts at Live Nation Europe, said: "In the coming weeks, we will unveil the headline acts for the first Wireless and Hard Rock festivals to be staged in London's new flagship venue, which promise to be the UK's blockbuster events of 2013." London Legacy Development Corporation (LLDC) chairman and London mayor Boris Johnson said: "Our vision for Queen Elizabeth Olympic Park has always been as a destination for world-class sport, as well as for major cultural and leisure events and last summer the world saw what an amazing venue we have created with our iconic stadium, sports facilities and new parklands. "The confidence now shown by one of the world's leading live entertainment promoters to relocate two of its biggest music festivals from the centre of the capital is a ringing endorsement of our legacy plans. Along with the other major international sports events we have already secured, this latest news proves that the park has a very bright future indeed." Details of the music acts and dates they will perform at the site will be announced by the spring. Hyde Park has staged rock concerts for decades but there have been noise complaints from residents. Last July, fans at Hard Rock Calling were left bemused when Bruce Springsteen and Sir Paul McCartney's microphones were switched off during a duet after a concert over-ran. Shows starring Springsteen, Rihanna and Coldplay are among more than 400 concerts and performances in Europe that Live Nation has staged in the past year. It also staged Hard Rock Calling, Wireless and BT London Live during the 2012 Games.